How many times do we find ourselves remembering our childhood? The days of gently brushing our doll’s hair, dressing them up in beautiful wedding gowns and daydreaming about the day when we, ourselves, would be able to look as priceless as them. Although our childhood days are over, the dreaming can still continue. But as we matured, so did fashion. The styles and designs have changed and evolved throughout the years. As your wedding day approaches, the daydreams rush back into your mind as you recall the beautiful dresses you once fantasized about. From magazines, the Internet and television, viewers have been exposed to memorizing bridal gowns for decades. The different shades of white and shapes have intrigued us, making it tempting to close our eyes and picture ourselves walking down the aisle in that perfect dress. A bride’s decision to pick a wedding gown will always remain one of the most vital decisions of the planning process–a decision she will always cherish. If you have a classic look in mind, we suggest your gorgeous A-Line fit. The dresses with this style resemble the letter “A”. In other words, the top will be narrower and it will gracefully flare wider towards the bottom. Looking to stun the groom? Find a dress with a corset top to give emphasis to your waist. Another great advantage to wearing an A-Line dress is that the strapless feature will draw attention to your toned arms and shoulders. This dress will have you feeling like royalty. If you have a pretty straight body without pronounced curves, we suggest the striking mermaid fit. This will add tons of emphasis to your body, particularly your chest and hips by flaring out around the knees until it hits the floor. This dress resembles a mermaid, hence the name, and will have you feeling absolutely beautiful on your special day. If you have larger hips and a small chest, we suggest emphasizing your unique curves with a princess fit. From years of watching fairytales, every bride imagines the option of wearing a romantic princess dress as she says, “I do”. This option has a fitted bodice with a full skirt with tulle. A princess/ball wedding gown style will give the illusion of floating which the light and fluffy layers of the dress create. If you are searching for an exotic and entrancing look, we suggest the Greek Goddess style. The waistline sits just below the bust and continues to flow down to the hem. This is perfect to accent a smaller bust. This is very simple yet so elegant and chic. Are you tall, slim or just really proud of your toned figure? We suggest the column dress to show off your spectacular body. The narrow shape of the dress will hug your body perfectly, which will accentuate your curves. This dress will showcase your picturesque body and your glowing beauty. If you are searching for a more conservative dress or are looking to go super sleek and sophisticated, we suggest a dress with long sleeves and a square neckline. If you are looking for the complete opposite but still want a classy look, try a V-neck. This adds major definition to your chest. Just make sure that the deepness is comfortable and appropriate for your wedding. However, if you prefer to showcase you bust but don’t want something as revealing, we recommend a sleeveless dress with a heart shaped neckline. Once you find the perfect dress for you, it’s time to find a complimentary wedding veil. A veil might seem like a minor detail, but it offers a romantic and angelic vibe. The veil can either be long or short depending on your dress and personal style. It is true that picking the perfect dress for your special day is a difficult task, but it is also momentous and exciting. 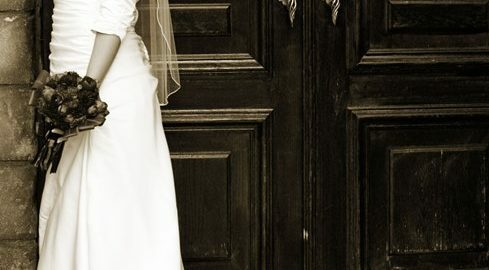 The best advice that we, The Tuscan Wedding, can offer you is to follow you instincts. Only you can truly make the decision…we are just here to guide and give you our full support. The right dress will eventually catch you eye and attention, just like the moment your true love did! What is your favorite wedding gown style? ?